Search “Native American” on any news site and you’ll likely be greeted by controversy surrounding the Indigenous Peoples March. But focusing on one incident incites momentary outrage and obscures the systemic problems Native Americans face every day. A viral video overshadowed the Jan. 18 Indigenous Peoples March. Social media flooded with videos of an interaction between white males clad in “Make America Great Again” attire, Black Israelites and Omaha elder Nathan Phillips. News organizations from NBC to Vox covered the interaction ad nauseam — yet articles about the march itself are few and far between. Outlets are keen to cover a viral incident, but not the march itself. They prioritize profit over people. About 10,000 people marched in support of the Indigenous Peoples Movement. The movement seeks legal, cultural and political representation for indigenous populations worldwide. There’s no good reason for small conflicts to overshadow thousands of people taking to the streets. Native issues can be life-threatening and must not be ignored. As a direct result of settler colonialism, police brutality and border town violence, Native American women are murdered at a rate 10 times the national average. After the Dakota Access Pipeline was approved for construction and use in 2017, it leaked at least five times, damaging its surrounding environments. Energy Transfer Partners, a joint owner of the pipeline, considered the leaks insignificant, but the incidents highlight the unpredictability of pipelines. The Tohono O’odham tribe’s lands in northern Mexico and southern and central Arizona are split by 62 miles of international border and may soon be split by the proposed border wall, too. There’s no reason for a high school boy’s ignorance to divert attention from indigenous issues. We’ve seen ignorance eclipse the purpose of the Women’s March, Black Lives Matter movement and any other instance where marginalized people make claims to their rights. Small, heated interactions are not newsworthy. It’s time for this legacy of violence and erasure to come to an end. These are issues where individual support and persistent media attention can make a difference. 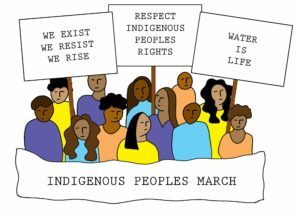 The thousands who came to the Indigenous Peoples March are ready for change, and we must support them. Deep-rooted problems should anger us as much as any viral video. We can do better. Donate to the Indigenous Peoples Movement or the scholarship fund created in Omaha elder Nathan Phillips’ name. Support organizations like Coalition to Stop Violence Against Native Women. Learn about the issues affecting indigenous people at the American Indian Resource Center on campus. Don’t let your activism end with an angry reaction on a Facebook video. Take action and support the movement, not the video.